Tokyo is a city synonymous with technology so anticipation at the glimpse of the future at the yearly consumer electronics show Ceatec was high. It did not fail to impress, reports Simon Perry from Tokyo. 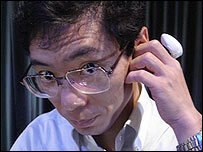 Japanese mobile operator DoCoMo showed the fruits of some of its research into mobiles with its Ubi-Wa, a ring that turns your finger into a phone receiver. Ubi-Wa has two meanings in Japanese - "Finger ring" and "Speak by finger" - which is exactly what it lets you do. DoCoMo is continuing the development of the ring. As it shrinks, it will be too small to sport functioning buttons. The solution is to tap out predefined rhythms with your thumb and the finger that is wearing the ring. Each unique rhythm carries out a different function. They call this UbiButton. Unlike much research which remains as vapour-ware, this actually works. Having tried it, the call clarity is impressive and it was simple to make and end calls. Shuttling data around homes in the UK can be a problem because few have network cables installed. Without them, delivering reliable, high speed data is tricky. Users can turn to wireless networks but thick walls in British homes can mean the signals do not reach all areas of the house, especially when high speeds are needed. One approach is to route data over electrical wiring already inside the house cabling, a technique named Power Line Communications (PLC). Mitsubishi Electric showed a PLC modem setup that will debut in Europe in November. It is fast enough at 200Mbps to distribute High Definition TV around the house. Given that any HDTV will need mains power, it has the added advantage of reducing the number of wires running out the back of the TV set. Often a staple of visions of the future, flexible colour screens that form a display for those on the move are edging closer to reality. Two different firms were on show at Ceatec, each designed to display different types of information. 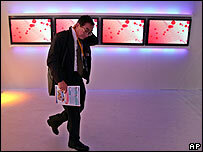 The one from Fujitsu is designed to display text and static images. It sees the screen being used in many different situations, such as with a mobile phone. The need for mobiles to be small means their screens restrict the amount of information that can be displayed. Fujitsu's approach is to use the phone simply to deliver the information, but have it displayed on a separate, flexible screen. This brings a far greater area for reading content and images, such as web pages. The product of five years research, it uses a technology called Cholesteric LCD (ChLCD). Once the screen has been updated, the image can be held for up to two months without needing further power. Fujitsu hopes it will to be available to the public in 2007-2008. For its part, Japan's version of the BBC, national broadcaster NHK, was showing the early stages of what it hopes will be the equivalent, but for displaying video. On show were three stages of its development. The first from a few years ago, simply displayed large moving colour blocks on a 24-pixel screen. The latest working development version was a box, around a metre square, with a mass of cables sprouting from it. Directly out of their labs, it was able to show recognisable but heavily pixelated video footage, this time at a better resolution of 96 pixels. The last of the three exhibits was a mock-up of what they would like to produce and could be the one that makes it into production. It was a pull-open version, similar to self-rolling scrolls, that it hopes to have commercially available in five years' time. A show like this has so many new developments in it, you end up feeling a bit shell-shocked. So perhaps it is time to see what is in the shops now, with a trip to the hi-tech shopping nirvana that is the Akihabara area of Tokyo.